This is the view from Sandy Beach Park of downtown Calgary on a late afternoon fall day. 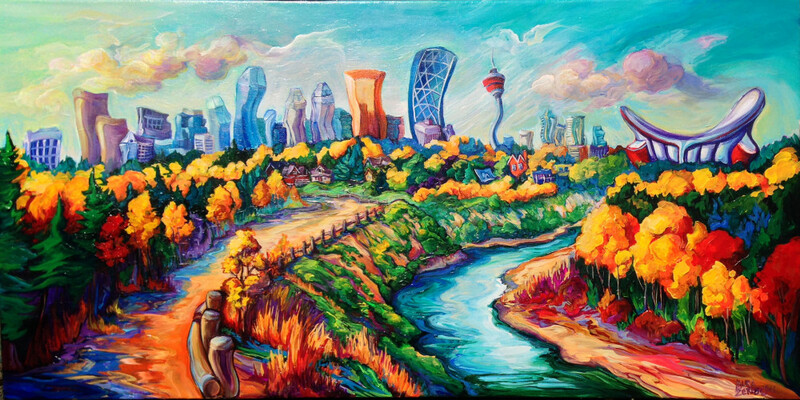 It shows the Elbow River winding towards Calgary’s distinctive Saddledome with the red-topped Calgary tower, the regal Bow Building, the Suncor Energy Center, and all the other skyscrapers dancing on the horizon. Sandy Beach is a haven for many, particularly dog walkers, bike riders, picnic goers, and river dippers. The scene is at that time of year in fall where the leaves turn and you get layers of gold interspersed between the rows of evergreens. Calgary is essentially a prairie city but there is dense vegetation in the river valleys. The light is just starting to turn from blue to gold which makes the river glow and the trees seem even more vibrant. It’s a perfect night for a walk. Calgary is a city built on natural resources so the foreground emphasis on the land with vibrant colors feels just right.